The beauty of drapes, the function of shades, and the light control of blinds combined into one soft, stylish window covering. The sheer facings gently filter sunlight and help block harmful rays while preserving the outside view. The soft 2 ½”, 3″ or 4″ vanes, available in Classic, Textured, Slub Style, Soft Stripe, and Room-Darkening styles, adjust to provide precise light control and privacy. Soft fabric vanes suspended between two sheer facings. When open, filters light, cuts glare. When closed, allows complete privacy. The sheer facings gently filter sunlight and help block harmful rays while preserving the outside view. Soft vanes suspended between the facings can be adjusted to provide precise light control and privacy. Classic – Linen-like translucent vanes in a variety of whiles, neutrals, and soft tones. Textured – Embossed-textured vanes with dimensional appeal. Slub Style – Tone-on-tone slub print with a natural fabric appearance. Soft Stripe – Fine, subtly-striped vanes with sophisticated elegance. Standard Continuous Cord Loop Control – The easy-to-operate continuous cord loop control allows you to open, close, and tilt the vanes, as well as lift and lower the shadings for precise light control and privacy. Cordless operation for child safety and pets friendly. Motorization – handheld remote control or via smart phone via radio Frequency (RF) systems. Shadings lift, lower and stop at the touch of a button. No dangling cords. Ideal for hard-to-reach windows. Undersize Tilt Only Shadings – available on window shadings 6” to 11 7/8” in width, this feature is a wonderful solution for narrow windows such as sidelights where privacy and UV protection is needed. Loose cords are a potential danger to children and pets. Our slim, Yet stylish cord tensioner helps keep the cord taut and anchored out of harm’s way. Our motorization options eliminate cords completely, providing added safety and security for your family. The durable contoured headrail and bottom rail are both color-coordinated to blend in with the shadings. When raised completely, the shading disappears into the headrail, concealing the bottom rail and providing a clean look and unobstructed view. An optional back cover is available to conceal the open rear side of the headrail for a more pleasing exterior look. Snap-in brackets are easy to install and hold shadings securely in place. Spacer blocks, extension brackets, and hold-down brackets are also available for installation flexibility. 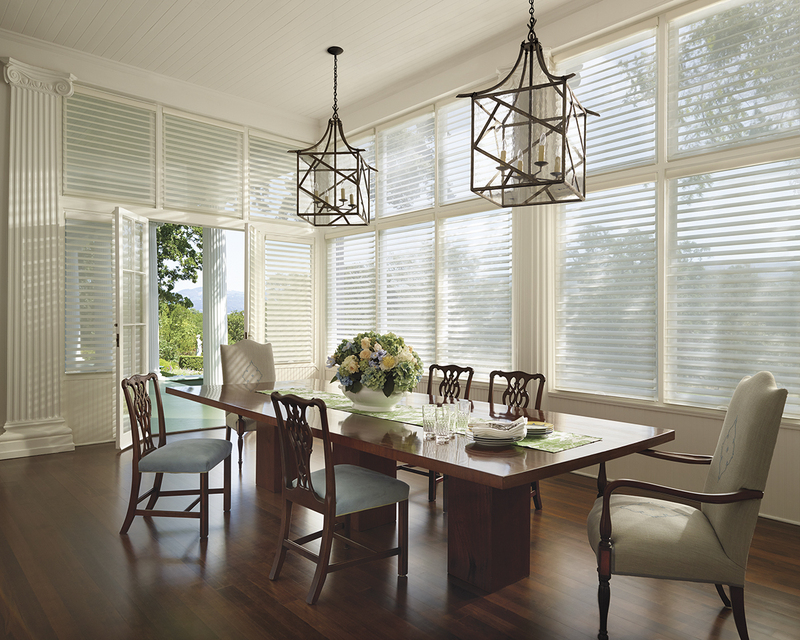 Silhouette Window Shadings are 100% polyester and are treated to resist dust, dirt, and stains. An optional dust cover is also available to help shield the fabric and internal headrail components from dirt, dust, and other contaminants. For regular cleaning, dust with a feather-like duster, or you may use a hair dryer on the low or cool setting to clean the sheers and between the vanes. Our window shadings can also be ultrasonically cleaned by a professional.